Melbourne has always been both the hippest and most normcore Australian city. Obsessed with cafes, coffee, fashion, sport, the right schools, and real estate Melbourne is either incredibly hip or dull and boring depending on which end of the Hume Hwy you live. What Melbourne does have, is a vanity domain space – the new .melbourne domain name. I recently spotted a puff piece in B&T cheerily titled “5 Marketing Benefits Of .melbourne And .sydney Domain Names”. As a former employee of a domain registrar who was deeply involved in the release of a lot of new domain names like .kiwi, .club, the awesome .tattoo, and many others, I was interested to see how .melbourne was going. Would I be surprised and delighted that the citizens of my hometown had been inspired to register their own .melbourne domain in the tens of thousands? Had Melbourne residents been filled with parochial pride at the thought of owning their very piece of virtual Melbourne real estate? .melbourne looks like a bit of a disappointment. To put it in terms Melbourne inhabitants would understand, .melbourne is like a quiet cafe with bad coffee somewhere in a busy East Brunswick strip. With 4,668 domains registered 10 weeks since general release, just over 467 domains have been registered a week. In fact averaging out the registrations makes the performance look better than it really is – only 8 domains were registered in the past week. Compared with .london which has had 2,882 registrations a week, .nyc which has had 4,503, and .berlin which has had 3,542, it’s pretty uninspiring. It’s worth noting that .berlin had a bit of head start with many thousands of domains being given away for free. This has made .berlin the fifth highest ranked new domain space. Unfortunately, the ntldstats data shows that only 17% of domains are being used so it’s unlikely .berlin will remain a top ten new domain space for very long. Comparing the usage of the city domain names is interesting. 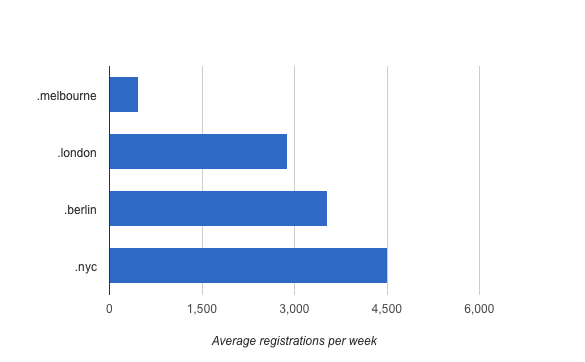 Even though .nyc has achieved the highest average weekly registrations, like .berlin it has a fairly low usage rate with only 25% domains being used. 38% of .london domains are being used, and in some good news for .melbourne, 76% of domains are being used. I’m unsure why so many are being used (or more accurately, are pointed to active name-servers) but it does point to a potentially high renewal rate. I suspect the high rate is because most names have been snapped up by proud government related bodies and local authorities. For comparison about 40% of .com domains in use is believed to be around 60%. One reason why .nyc might be smashing it is reasonably priced. A .nyc can be registered for around $31 through Name Cheap while .berlin, and .london are around the $45 mark and .melbourne is $69 through Crazy Domains. Melbourne real estate really is more expensive than New York. What about population? Each of the city domains requires a geographical address in the city to be registered. The exception is Vegas which is understandably easy and open to anyone (and anything). 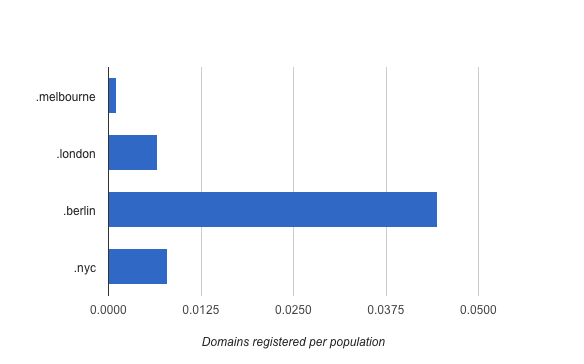 Well, .melbourne is pretty unpopular here too, with only 0.11% domains registered for each Melbourne resident. .berlin is the most popular due to the free-for-all in 2014. It’s hard to tell what the future is for .melbourne or any of the new domain spaces. But without a big increase in .melbourne domains registered it is hard to see any genuine affection for the domain developing just because “Internet users can feel confident they’re dealing with genuine and trusted entities” as the article claims. It all sounds pretty dull and boring. I would love to see the credible research into what makes “Internet Users” confident. I suspect it ain’t a domain name. .melbourne needs to do more than make Internet Users feel confident. It needs to capture the spirit of the city and inspire creativity. Until it does it will remain dull and boring, a bit norm core. The picture is of Bourke Street in the 1950s. This was a time when the pubs closed at 6pm and the city was devoid of hipsters and deeply conservative. Previous post: What would Seth do?